Click on the pictures below, we have many houses and kits to choose from. We have lots more in the shop! One thing to note is that it can be VERY expensive to ship Dollhouses across country. When you are budgeting to buy a Dollhouse on the Internet, you should allow for Shipping Costs, including Packing and Insurance. 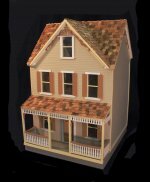 We can provide quotes should you be thinking of buying our Dollhouse.